You can’t say goodbye to the city life even when you are on holidays, but you do want to avoid the hustle and bustle of big cities? Then, Lixouri is the place for your dream holidays on Kefalonia. It is one of the most picturesque towns of the island whereas it’s big enough to provide everything you find in a city. It is the second biggest city after Argostoli and the largest one in the peninsula of Paliki. However, it is a beautiful and quiet modern town with rows of trees along the well-constructed streets, nicely decorated squares and houses with gardens full of flowers. It has rich history since the ancient city of Pali, which belonged to the four major cities of the Kefalonian tetrapolis, is situated a bit further north, in the location of Paliokastro. The ancient city was named after king Pileas and was so powerful that issued its own currency. The modern name of the city was mentioned for the first time in a document of the year 1534, which proves its historical existence and its quick development. Lixouri played an important role towards the union with mainland Greece that followed the British occupation. In 1848, 200 locals fought with the British army in order to take back their city, but they failed. The city changed dramatically in the early 19th century, when streets churches and public buildings were built. Unfortunately, Lixouri was almost entirely destroyed by the earthquake in 1953. The city was rebuilt with respect to the traditional architecture, unlike other places on the island. One of the few buildings that survived the earthquake was the Typaldoi-Iakovatoi mansion which nowadays has been turned into a library and is one of the most important sights in Lixouri. The library has a rich collection of 25000 books and is the home of many rare publications and other literary treasures. In the front yard of the mansion, cultural events are organised during summer. 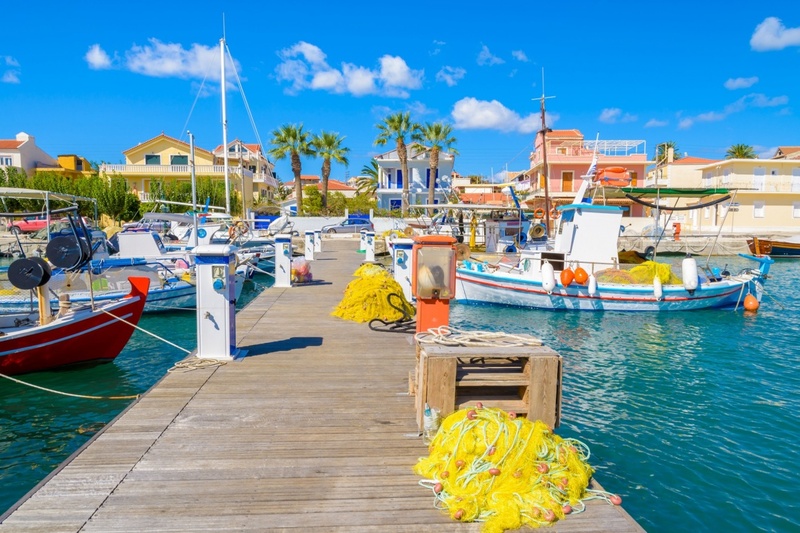 Residents of Lixouri are famous for their music tendencies and their musical background, that’s why the town is the home of the second oldest philharmonic orchestra in Greece. The orchestra gives amazing concerts and takes part in public parades in Lixouri. Other important sights in the area are the ancient city of Pali which was probably a Corinthian settlement, the church of Agios Charalampos -the patron saint of the city- and the statue of the satirical poet, Andreas Laskaratos. The statue has its back turned to Argostoli, giving a humorous touch to the old rivalry between the two cities. In the present day, Lixouri is divided into two parts because of a stream crossing the town. In order to go from the one side of the city to the other, you will have to cross one of the small bridges above the stream. It is a lively city with all the necessary facilities, such as banks, pharmacies, public services and even a hospital. If you choose Lixouri for your stay on the lovely island of Kefalonia, you don’t have to worry about accommodation! There is a large number of hotels and studios to cater for all kinds of travellers and all preferences and tastes. The locals are going to give you a warm welcome and offer their best services in order for you to have the most amazing holidays in Kefalonia! Of course, holidays in Greece mean delicious food and in Lixouri, you will find a lot of traditional “tavernas” and restaurants serving both Greek cuisine and international dishes. Apart from Greek, Italian dishes are particularly recommended, since the island is very close to Italy and the Venetian influence of the past is still apparent on many aspects of the culture of the Ionian Islands. For desserts and other delicacies, head to the main square of Lixouri and enjoy them while you are having romantic walks on the picturesque beach. If you would like to go out for the night, there are a couple of discos outside the town, but for some real fun, Argostoli is the right place to go! It is 35 kilometres by car and it is definitely worth the drive if you want to party until early in the morning. It doesn’t matter though if nightlife in Lixouri isn’t as vivid as in Argostoli, since the dramatic coastline of the peninsula of Paliki will reward you with amazing sceneries, natural spas with reddish sand and emerald waters. Here is located the well-known Xi beach, which is exactly that: a natural spa! The sand is rich in clay which is good for the skin. Lepeda beach with the impressive rocks is good for snorkelling whereas on the beach of Kounopetra you will see one of the landmarks of the island, the moving rock! The big rock found on this beach used to move in a rhythmic way, but no one could explain the reason of this strange phenomenon. Two of the most impressive beaches in the area of Lixouri are the beaches of Petanoi and Platia Ammos. Both are quite unspoilt and therefore are perfect for couples and nature lovers or simply for those seeking some privacy and relaxation. Petanoi has been awarded the blue flag and could compete the beauty of Myrtos beach. Platia Ammos used to be accessible only by boat, but nowadays you could go there by climbing down more than 200 stairs! It might not be the best option, but as soon as you are there you will be impressed by the crystal clear waters and the white shingles of the beach. Other beaches in the area are Atheras beach, Agia Eleni, Lagadakia, the bay of Vatsa, Vrahinari beach and Megas Lakos (or Mia Lako). Even though Lixouri lost the candidacy for the capital of the island, you might find it equally worthy of it and probably a lot more beautiful than Argostoli. Visit both cities and find out which one should be the winner of the rivalry! Find information about selected Hotels, apartments and rooms in Lixouri to choose the perfect place for your accommodation.